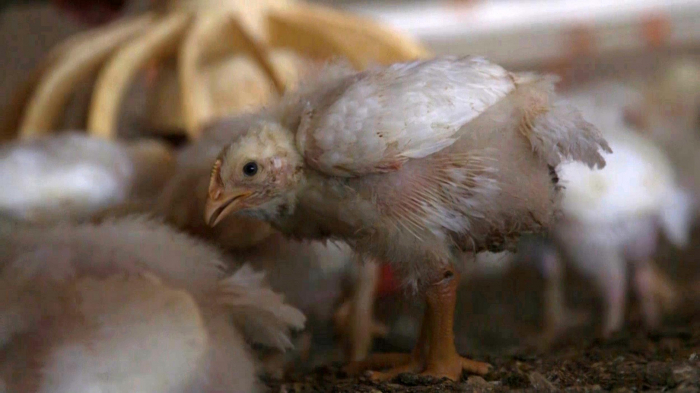 KFC, McDonald’s, Nando’s and Domino’s Pizza are subjecting billions of chickens to lives of misery that end in a painful death, according to what is thought to be the first global investigation of its type. World Animal Protection (WAP)’s report found “an almost-universal disregard among the brands … for improving the treatment of chickens throughout their global supply chains”. The fast-food brands say they adhere to Red Tractor standards or their own animal welfare guidelines, or exceed minimum legal standards. About 40 billion meat chickens – or broilers – are raised each year in factory farms, living in pain and suffering lameness, skin lesions and even heart failure, the report claims. Two-thirds are genetically selected to develop so fast their legs cannot bear their weight, and are raised in barren, dark warehouses that curb their instinctive behaviour, the report says. It identifies six common problems: being bred to grow too quickly; overcrowding; cages that severely restrict movement; alien, unhealthy environments; unnatural lighting, and often “squalid” conditions. No company was graded higher than “poor” in the report. Domino’s was judged “failing”. KFC, Nando’s, Pizza Hut and McDonald’s were rated “very poor”. Three of the nine – Burger King, Starbucks and Subway ­– had policies to address the problems but in only one region or country, while none had a global policy on improving chicken welfare, the report said. Transparency was “universally poor, with all companies providing little or no information to show how they are performing when it comes to chicken welfare”, it added. “Notable exceptions [on welfare] occur in some regions,” the document says. “For example, in the UK, natural light and enrichment are being introduced by a few companies. Three months ago, WAP handed KFC a petition signed by 500,000 people in at least 10 countries urging the company to give its chickens better lives. Jonty Whittleton, of WAP, said: “There is no excuse for the pain, fear and stress that a factory farmed chicken feels for much of their life. Billions of chickens never get the chance to see sunlight, to grow at a natural rate or behave as they would do in the wild. The Change for Chickens campaign is calling on the fast food industry to source birds from higher-welfare farms, avoid use of live shackling and ensure they are unconscious when slaughtered. Pizza Hut and Domino’s both said they would comment soon on the findings, and McDonald’s said it would comment, but did not do so before publication. Starbucks and Burger King were approached for comment but did not respond.